If you don’t know what they are, they’re used to insulate electrical wires on the poles you see alongside of the road. This style of insulator is very old but they still use glass, I believe. My grandma had a few just sitting around her house, and I knew I had to get this for decoration. It’s heavy enough it could function as a doorstop, but I might stick it on a shelf so that I can admire it. There it is with my electrical insulator and two of my Gibson cookie jars. And did you know there’s a way to tell between old Fiesta and new? The old Fiestaware has a lowercase “fiesta” logo on the back/bottom, but the newer Fiesta has an uppercase “Fiesta” instead. 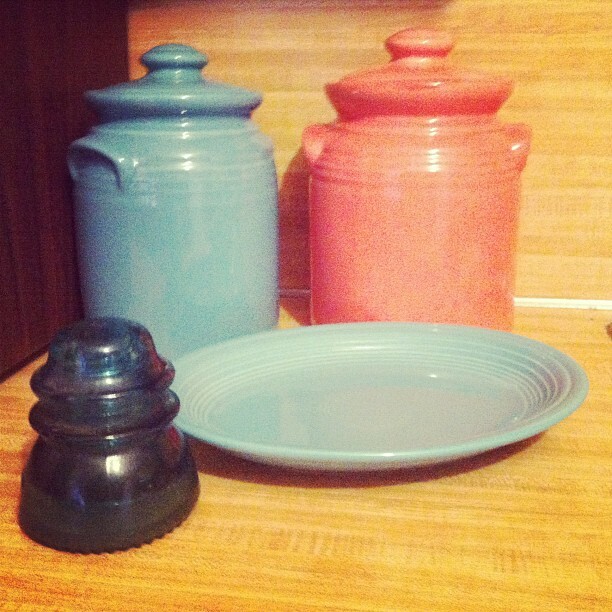 The old pieces are collectible, so I’m very proud to have found my own first piece! My grand total for both items today was $18, so I was very excited. How totally retro! I love it so much. 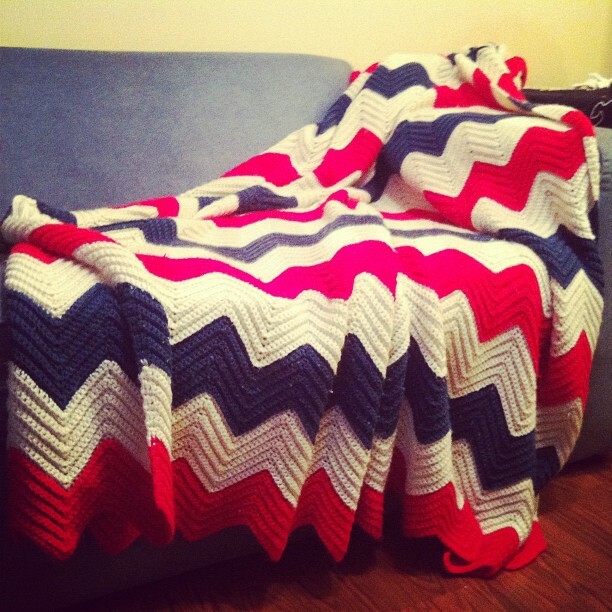 It’s huge and it’s very well done and it makes me so happy to look at and snuggle under! I loved making these photos look even more retro-y by using Instagram on my boyfriend’s phone. I don’t have a smartphone but I love the different vintage effects you can put on pictures, so I’m overtaking my man’s phone and ditching my lousy point-and-shoot camera that forces me to laboriously edit every picture I take in Photoshop. Sorry I was so chatty today. I really like thinking that people might enjoy reading about the little things that make me happy, so sometimes I just can’t keep from sharing with you! I could actually go on and on — I enjoy writing and sharing happy things with others — but I do realize that I have my whole life to blog, so I can take it slowly. With that, I’ll bid you a good evening! See you soon! Thank you for following my blog – great to have you along! Love your cookie jars and that blanket – wow, actually WOW! It’s amazing. 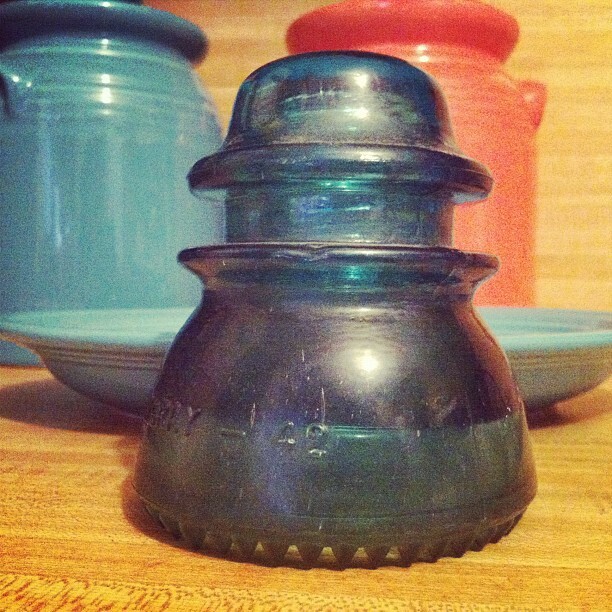 I’ve never seen those glass insulators, but just like you, if I found one, I’d have to have it – love collecting vintagey, homeley stuff! Thanks for the comment! 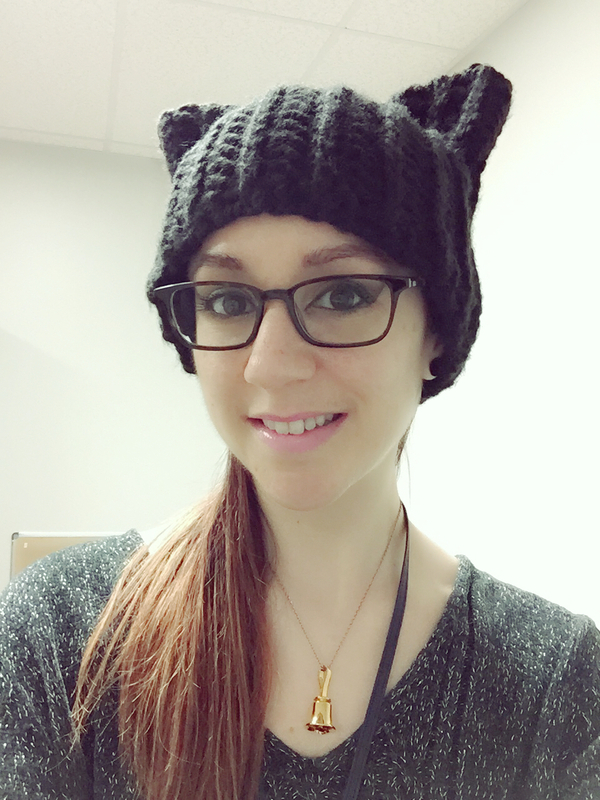 Your blog just looks so lovely, I’m excited to read more! I wonder if you know of bookcrossing.com? It’s FAB. Thanks! I have never seen bookcrossing.com, it looks really neat!